Blog from Bali, Indonesia | Ed and Rachels World Tour! So we've spent the last few days just soaking up the sunshine and relaxing alot ( which can be pretty tiring i tell you! ) Yesterday we lat by the pool going in for the occasional dip to cool down - you stay out in the sun long enough and you end up as wet as the water anyway! Its hot hot hot and very humid resulting in some very sweaty english folk! We had a massage, which was fantastic! Neither of us had had one before and it was just heaven! I'm not sure i liked having my neck and toes cracked but by that point i could hardly stand up i was so relaxed!! And all for less than a fiver! We call that a bali bargin!! We thought we'd hit the shops in the afternoon and try our hand at bartering with the locals! Its really hard work but we got pretty good at it! Ed wasn't too pleased when i got the same thing cheaper but i drive a hard bargin! It was fun but when you work out what we spent you realise that you were fighting with them over less than 50p which is a meal to them so today we were more generous! Today we lounged around again in the morning then did a bit more shoppong before sending 12kilos of stuff home by ship! We did alot of shopping! Things are so cheap! Its great but we both want to buy more! we have to keep reminding ourselves that we're travellers! I had a bali manicure today and while i sat there ed had his nails too! ( he wasn't man enough to fight the women off him but he did manage to avoid having them painted!!) We went down on to the beach to watch the sunset, it was the most beautiful sight! The sky went an electric orange which reflected copper in the wet sand, it just glowed and filled the sky! We've booked to go on another trip to visit a water temple and then head up north to Lovina for a few days. 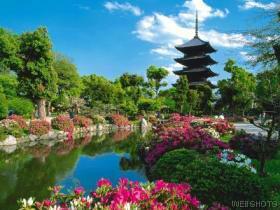 We're also going to see some waterfalls, a lake temple and some hot springs befor ecoming back down to stay at sanua. Hopefully it will be a good trip, it will be nice to get away from the hustle and bustle of kuta for a while! Its lovely here but it gets to you after a bit, and when the people beg you to go in you know its their whole life but to you its just a bit of money that you won't spend because you've alreay got some stuff - you feel like you want to help everyone but you cant.